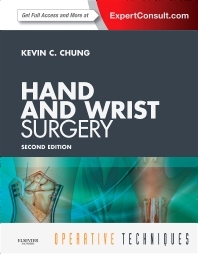 Hand and Wrist Surgery, edited by Dr. Kevin Chung, shows you how to perform all the latest procedures and get the best results. This medical reference book in the Operative Techniques series uses step-by-step descriptions, illustrations, and videos to provide all the guidance you need to succeed. Search the complete contents online and watch all the videos with expertconsult.com. Improve your technique and optimize outcomes with pearls and pitfalls from the authors.